The Democratic party is still in a battle for their nominee–a choice between an cranky socialist and a cackly criminal. Oh, and by the way, today is the 65th annual observance of the National Day of Prayer. 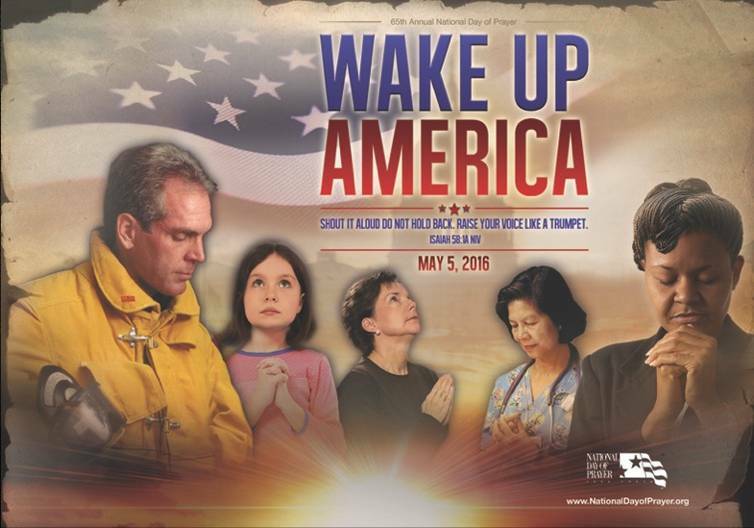 The theme this year is “Wake Up America.” And the theme verse is Isa 58:1 “Shout it aloud, do not hold back. Raise your voice like a trumpet.” While the prophet spoke of God’s people, Israel, and their need to pray and repent of their sins, this theme and thought is appropriate for America today. More than ever. According to NDP web site a joint resolution by Congress which was signed by President Harry Truman in 1952 declared an annual national day of prayer. In 1988, President Ronald Reagan signed an amended law that set aside the first Thursday of every May. Since then every President has signed a proclamation, encouraging Americans to pray on this day. Our forefathers believed in God and in prayer. The first Day of Prayer was in 1775, when the Continental Congress asked the colonies to pray for wisdom in forming a nation. Calls for national prayer continued throughout history, including President Lincoln’s proclamation of a day of “humiliation, fasting and prayer” in 1863. As a nation we have strayed away from God. There are many problems that plague our land. We are dealing with issues that threaten the very foundation of our country that is causing it to crumble. Our moral fiber has been weakened. Our spiritual roots are eroding. Our families are disintegrating. Our political leaders have no respect for God and his Divine Word. It seems that America has reached a point of no return. I’ve seen some of my preaching colleagues on facebook declare that we are dead, based on our political and moral state. They may be right. However, Christianity was born in a corrupt culture. And as evil as the Roman Empire was it lasted another 400 years. Our current climate is discouraging to Bible Believers. But more than ever, we must be the salt of the earth. The light of the World. And we must pray. Jehovah’s words to Solomon regarding Israel aptly describe our need today. “If My people who are called by My name will humble themselves, and pray and seek My face, and turn from their wicked ways, then I will hear from heaven, and will forgive their sin and heal their land” (2 Chr. 7:14). In that spirit on this national day of prayer, I offer this simple petition. We acknowledge you as our Creator. Our Protector. Our Sustainer. The One and only true God. Father, our land is broken. Hearts are hurting. And the souls of our citizens are being sacrificed on altars of selfish ambition, personal pride, materialistic pursuits, moral compromise, political correctness, and unbridled lusts. We pray for our governmental leaders. From our local communities to the President. May they seek your counsel, wisdom and will. May decisions be made and laws enacted that honor Truth and Righteousness. We pray that during this contentious and confusing election year, that as Christians, we may be united around Jesus, as our only Lord and Savior. May we love one another in spite of personal opnions and political differences. We pray for our homes. Strengthen husbands and wives. Parents and children. May the family values of your Word be once again valued, taught and lived as we mold young hearts. We pray for our religious leaders. May churches, preachers and pastors be faithful to your Word. Proclaim your Truth. And reject and repudiate every false way. We pray personally that each of us may examine our own hearts. Admit our sins. Confess our failures. And humbly repent. We ask your forgiveness. We seek your guidance. We beg for your mercy. Thank you, Father, for your love. For all blessings, both physical and spiritual. And for the gracious gift of Your Son through whom we can receive redemption. Deliver us from evil. Protect us from harm. Give us strength, courage and resolve to be faithful. With thankful hearts we offer this prayer in the name of Jesus, our Rock and Redeemer. What a great article Ken Weliever! We have strayed so far from God in our nation that we are even thinking of removing “in God we trust” from our dollars. I will be praying for our nation! I needed that. Don,t know where our nation will be in 4more years. Can it be worse – yes. I pray for my grandchildren. What have we left them.